distribution Present over the eastern Piedmont and western 2/3rds of the Coastal Plain. Ranges west to Rockingham and Anson counties; and east to Northampton, Beaufort, and Pender counties. It seems to be absent in the far eastern counties, as well as in the western half of the Piedmont and the mountains. abundance Puzzling. Most references consider this to be a rare species, yet the great number of counties recorded in NC suggest otherwise. Hardly any biologist alive in NC seems to be familiar with the species, as there are no NC photos on websites and no recent observations. It has been recorded in 29 NC counties, but just one in VA, three in SC, and two in GA (OdonataCentral range map, 2018). And, specimens from Duncan Cuyler and others at the University of Florida yield only 14 date records. Where are all of the other records? Undoubtedly the species has also declined in recent decades, as a species this "widespread" and not overly difficult to identify should certainly have been found in the last 20 years. Despite what the map shows, this is clearly a rare species in NC today. flight The NC flight occurs between late June and mid-August. habitat Creeks and other slow-moving acidic streams, in forested areas. behavior Adults are somewhat secretive. They are most frequently seen flying 30 or more feet above ground, in late afternoon. They perch on twigs, but often well above ground. Males can sometimes be seen patrolling over streams. comments Exactly why there are so many more records for NC than in practically any other state -- just about half of all county records known are from NC (!) -- is not known. Despite it being colored like no other dragonfly, and should be obvious when seen, it is clearly not often encountered except with a purposeful search (such as near dusk), or with long nets to catch high-flying dragonflies. Because there have been no recent records, the NC Natural Heritage Program has moved the species from its Watch List to the Rare List in 2012. 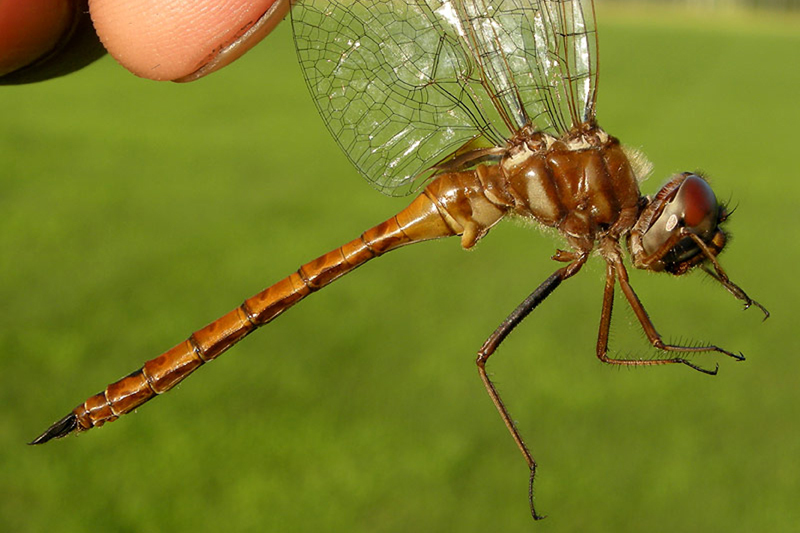 We agree with Paulson (2011): "This is one of our rarest dragonflies, very seldom encountered in most of its range." Some enlightenment on this mysterious species was made by Chris Hill, who netted and collected one in Horry County, SC, on 25 June 2015 (OdonataCentral photo and data). He indicated that the species is very hard to capture, and this strongly suggests that most of Cuyler's apparent non-specimen records were sight records.